Tomorrow, Assembly Bills 440 and 441 will have a hearing in the Nevada Senate Legislative Operations Committee. Why does this matter? 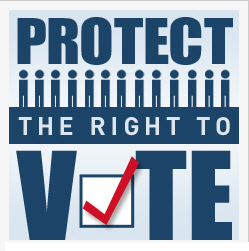 Because these bills are critical to expanding voting rights in the state of Nevada. AB 440 extends the voter registration deadline so more Nevadan have the opportunity to register vote, while AB 441 makes voting on election day more convenient by adding additional voting locations to choose from. Republican governors and legislators across the country are trying to restrict voting rights because they know the only way they can win elections is to stop as many people from voting as possible. We cannot let this happen! We need you to contact legislators on the Senate Legislative Operations Committee right now and tell them to expand voting rights by passing AB 440 and AB 441. Ask/tell them to pass these bills now.